The secondary market of a Massively Multiplayer Online Role Playing Game is the market where players exchange virtual goods and services for real money. In this article I include both Action RPGs such as Diablo 2 and MMORPGs such as Runescape. They are not exactly the same but from an economic perspective there is little point in treating them as distinct markets. If players can interact and exchange in-game commodities in a persistent online world, then for the purpose of this article it’s all the same. I am using average concurrent players as main metrics because I believe this figure is the most relevant for game popularity and secondary market. I am also assuming that bots have no effect on the demand that instigates real money trading so they are subtracted from my calculations. Many of the sources for this article are unofficial quotes given from various retailers of virtual goods so don’t be frustrated over the anonymity. If you were a vendor on a borderline black market you would not want your sales made public either. Piecing together these quotes with official figures has allowed me to arrive at the estimates I give in this article. Take it with a grain of salt if you like. Chances are it is pretty close to the truth. Please also note that I elaborate far more on games in which I have experience and expertise. These being Diablo 2, Runescape, and EVE Online. We will start with Diablo 2 – on closed battle.net – which was one of the first online games to harbour a significant secondary market. It started out on eBay shortly after its release on June 29th 2000 and spread to stand alone webshops in early 2001 – a year during which the secondary market averaged roughly 20K dollars a day according to my calculations. The market peaked at around 50K dollars a day between 2007 and 2010 after which decreasing player numbers as well as saturation started taking their toll. It is important to understand that the market growth through these years was not due to increased player population. We are talking about a pretty stable player population of 100K average concurrent players that spent an ever increasing amount of money on virtual items that grew cheaper and cheaper as they became more and more common. Very much like in the real world where we spend ever more money and get more and more material belongings. It was a snowball effect. The more players that had the best gear, and the more sophisticated the best gear became, the more players jumped on the real money trading bandwagon to keep up. The game also has an incredible build and item variety encouraging players to level up and equip countless characters. So once a player has started buying on the secondary market, chances are he will spend a lot of money over the next couple of years. The market was also spurred by infrequent content updates such as changed monster difficulty and new items as well as ladder resets (the first ladder was introduced in July 2004). The last significant content update by Blizzard was the Hellfire torch that came with 1.11 patch in August 2005, and after that the only novelty that Blizzard brought to the game was their infrequent ladder resets and the skill point reassigment quest reward. 1 However, Blizzard was not alone in forming the game. Certain retailers on the secondary market developed very advanced bots and eventually managed to produce perfect items of all kinds which kept the market going strong up until 2010. These 100K concurrent users – out of which 25% were probably bots – are like I said estimated to have spent an average of 50K dollars a day on items in the game between 2007 and 2010. This is around 18 million dollars a year or 0.5 dollar per average concurrent player and day. Adjusting for bots gives 0.66 dollars per concurrent player and day. It should be noted that the removal of virtual item listings from Ebay in early 2007 had a positive effect on the Diablo 2 secondary market size seeing as all active buyers had to turn to webshops which in turn meant better selection, faster deliveries, and targeted marketing to go with that. Advertisement increases sales of virtual goods just as much as it does for real goods, if not more, considering that it’s such a fast transaction with no logistical complications. And a webshop with a customer database and in-game spambots is a whole lot more effective at reaching its target audience than merchants on eBay. Since the launch of Diablo 3 on May the 15th 2012, the Diablo 2 player population has shrunk to roughly 17K average concurrent players, and the average daily sales volume has shrunk to roughly 5K dollars a day which is only 10% of what it used to be. The player population started shrinking significantly already in 2011 though for completely different reasons which I will get back to later. Anyway, as you can see the decline in sales is much larger than the decline in player population. This can be explained by a relative decrease in interaction. The number of unique player interactions increases exponentially as player population increases. Conversely, when player population shrinks, the number of unique player interactions shrinks exponentially. 2 players allow for 1 unique interaction whereas 3 players allow for 4 unique interactions and so on. And it is from the sparks of player interaction that commerce is born. Few players are happy with less than what other players are sporting, and more often than not players have things they don’t need that other players could use. What it all boils down to is that increased player interaction increases demand for and ultimately transfer of virtual goods. And in a world with more or less unlimited resources to be mined by pioneering entrepreneurs, the bar will quickly and continuously be raised until the majority of players have attained all the virtual goods they can envision themselves having. Unfortunately, what players really want is the respect of other players, and when the market is saturated with virtual goods and services there is very little respect to be had. The player field is leveled. Everyone is the same and there is nothing new to experience. Just the same old tedious spam bots advertising the same old items that everyone already has, and ever more introvert human players. This is when people leave the game and move on. And this is precisely what started happening to Diablo 2 in 2011, long before Diablo 3 was released. Runescape was originally released in January 2001 but did not attain much popularity until it was rereleased with a rewritten game engine on 29th March 2004. Runescape is more or less contemporary with Diablo 2 but very different in that it has free to play option, subscription option, and that the game allows for much more extensive player interaction. Where Diablo 2 is split up in USWest, USEast, Europe and Asia, as well as classic, ladder, non-ladder, hc ladder, hc non-ladder – effectively partioning the player population into 20 isolated populations – Runescape has one single player population that can move between all servers instantly and interact with all other players in a largely instance-free environment. In Runecape up to 2000 concurrent players can interact with eachother in-game at any time. In Diablo 2, only 8 concurrent players can interact with eachother in-game at any time. And whereas in Runescape all servers are open to entry, most Diablo 2 instances are password protected, further reducing the interactivity of the game. It should be noted that Diablo 2 has in-game chat channels where more players can interact but these do not measure up to interaction during actual gameplay. There is only so much text that can fit into a chat window, and a player can’t change topic or chat partners without disrupting the chat. This is the primary reason why Runescape, since its rerelease in 2004, has always had a bigger secondary market than Diablo 2 relative to its player population. Sure, Runescape has always had more frequent content updates but it has never had the sheer item and build variety of Diablo 2 and in the end those two qualities balance eachother out leaving only player interaction as key difference. I don’t think the ease of trade brought on by the inherent game currency in Runescape spurred real world trading relative to Diablo 2 for d2 players quickly adopted their own currencies in the form of sojs and later on runes. If there is a demand for something, then trade will happen, one way or another. The key is the demand. If there is a demand, then the players will work out supply and delivery all by themselves. The player population grew to six times its original size between 2005 and 2007 and continued growing up until mid 2008 when peak concurrency hit 250K players and average concurrency around 150K.2, 3 In September 2008, Jagex reported a subscription turnover of roughly 47 million dollars for the past year 4. This is indicative of an average of 780K subscribers over the whole year assuming a monthly subscription fee of 5 dollars. The variation between the months was likely quite huge because Jagex reported breaking the 1 million subscriber mark for the first time in April 2007 while at the same time the total number of active accounts was reported at roughly 9 million. 5 Around 40% of Runescape players are bots – even today with all the stringent measure taken against them – with the reservation for temporary drops after mass bannings6, 7. This leaves 3.6 million legit accounts. Seeing as one account equals one playable character and most people had many characters that they regularly played, the actual number of humans must have been more along the lines of 1.5 million. Based on what I saw on auction sites, my own sales, adwords search volumes, alexa traffic ranks, and quotes from other sellers, and then extrapolating using the Diablo 2 figure, I estimate the secondary Runescape market at 100K dollars a day towards the end of 2007 or a full year revenue of 36.5 million which is around 75% of the revenue on the primary market. With an estimated human average concurrency of 90K (bots subtracted) we get 1.11 dollars of revenue per average concurrent human player and day. This is roughly twice the amount an average Diablo 2 player would spend (in a similarly sized player population). In January 2008, Jagex introduced changes such as Grand Exchange, no player looting in wilderness, no free trade, and no free staking in duel arena. The changes reduced real money trading because it suddenly became much easier for players to buy what they needed using gold and it became much harder for players to lose their goods via pking, staking, and trade scams. Although the grand exchange shifted real world trading from Runescape items to Runescape gold without impacting sales volume enormously, the other changes made sure of a volume decline. 3 years later after a change of leadership within Jagex, vocal community members instigated an official poll that ended on the 14th of January 2011 in which 97% of the 1.2 million partipating players voted for the return of free trade. 8 On the 1st of February 2011 Jagex reintroduced free trade. 8 Their official position was they now had the necessary antibot tools they needed to handle the return of free trade and the real money trading that would come with it. It is probably true, but only part of the truth. They wanted to bring more players into the game so they could monetize better on it. And not only on subscriptions. They also had microtransactions up their sleeve such as Squeel of Fortune introduced on the 28th February 2012 and Solomon’s general store introduced on the 17th July 2012. With the return of free trade, pk looting in wilderness, and staking, Runescape did see some increase in popularity but long term the trend of dwindling player numbers has been sustained and the average number of concurrent players as of January 2013 is only around 65K which is 43% of what it used to be at its height. Since my market share is non existant these days, I can only make an educated guess at the current sales figure of the secondary market of Runescape. But if I were to take a guess based on concurrent players, google adwords search volumes, and auction site activity, I would say that it’s no more than 40K dollars a day. The difference compared to 2007 can probably be fully explained by the reduced concurrency. During the 2nd half of 2011 the trend came to a halt and the player numbers sank down to 70% of the peak value. Player population normally goes up by 20% with content releases and then down by about 15%. However, it was not until Retribution expansion in December 2012 that player population started getting back to normal. Peak concurrent players are now near 60K and average players around 34K compared with 36K at the time of the peak record.11 It seems to be a general rule for all popular MMORPGs and action RPGs with international player base that average concurrent players are 60% of peak concurrent players. Based on average number of concurrent players, online auction site activity, rumored sales volume for top ranking websites, and factoring in Diablo 2 and Runescape figures, I arrive at 35K dollars a day in 2ndary market turnover for EVE Online on Tranquility server. Based on CCP banning reports, I estimate that no more than 5% of player population is made up of bots. Thus we get 1.08 dollars per average concurrent player and day. This gives a total of roughly 13 million dollars per year which is around 20% of the primary market revenue as per official CCP report (66 million dollars in 2011). EVE Online is quite unique among western games for monetizing that well on its player population. For comparison, Runescape has roughly the same revenue with twice as many concurrent players. EVE Online, although a subscription game at the core, derives a large part of its revenue from microtransactions out which one is pay to win (Plex can be traded for ISK). For pure subscription games, which are a dying breed, the secondary market is likely 50%-100% of the primary one depending on how popular and interactive the game is. For microtransaction oriented games the figure is more along the lines of 25-50%. This is not because of an inherent conflict between the microtransaction business model and the secondary market. It is because microtransactions are so lucrative compared to pure subscription. Ultima Online, released on the 24 September 1997, is attributed with popularizing the whole MMORPG genre being the first MMORPG to pass 100K active subscribers. 12 The term MMORPG was in fact coined by the game creator Richard Garriot. Hence, it is most fitting to include it in this article. Bear in mind that this is not a game I have personally conducted business in, nor have I received any unofficial quotes, but there is plenty of press and studies on the secondary market of this game. During two weeks in April 2004, the market volume of virtual goods from Ultima Online traded on eBay was $156,857 with a player population of roughly 125K active subscribers out of which few if any were bots. 13 During 2003-2004 the player population was pretty stable so we can quantify the results without distorting data too much. Granted, secondary market activity may vary over the year even with a stable player population but this would be unlikely on eBay this far into a game’s lifespan. Anyway, over a year this gives 4.78 million in secondary market revenue on eBay. It is unclear how big portion of the secondary market eBay took up so I will reverse engineer the non eBay sales figure. It is important to understand that Ultimate Online is very unique in that it popularized not only MMORPGs but also real money trading. The game company behind it, Origin Systems, officially advocated real money trading and even sold cheap basic players accounts themselves. Basically, it was socially accepted in the game and the majority of players engaged in the activity in varying degrees. And it was not just currency – it was accounts, castles and items as well. Castles were sold for anywhere between 100 and 1000 dollars. In so far as the secondary market, Ultima Online had pretty much everything except huge player numbers (by todays standards). 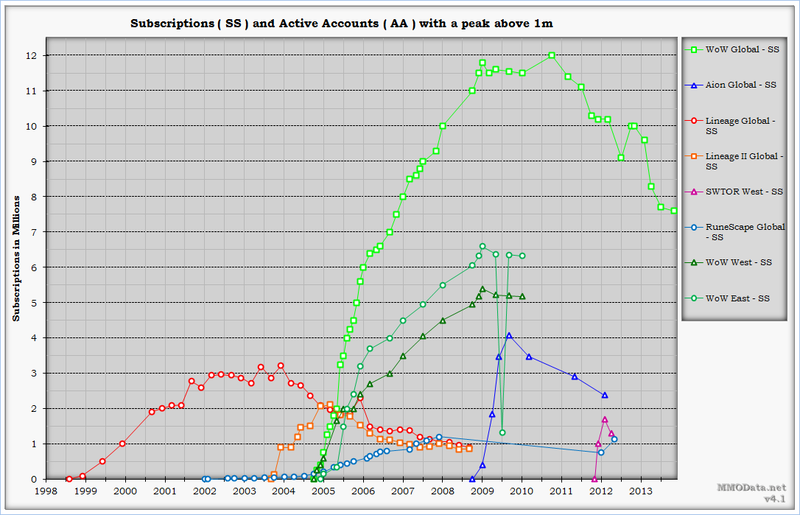 The relationship between active subscribers and average concurrent players seem to be around 10:1 in most MMORPGs (See Runescape and EVE Online above for references). However, Ultima Online probably had higher average play time per subscriber than most MMORPGs being a pioneering game populated by geeks. Thus I assume an average concurrency of 25K players. Ultimate Online charged around 10 dollars per month for subscriptions. This yields an annual primary market revenue of 15 million dollars. The game shares so many similarities with Runescape that there must have been a similar relationship between primary and secondary market in the two games. The fact that Jagex worked against real money trading, and Origin Systems supported it probably balances out the difference in player concurrency. This gives us a figure of roughly 10 million dollars per year out of which nearly 60% would be non eBay transactions. 2. Vlad Nae, Alexandru Iosup, Radu Prodan. Dynamic Resource Provisioning in Massively Multiplayer Online Games. Transactions on Parallel and Distributed Systems. 13. FREDRIK SAGELIUS. Pengar och ekonomi i och kring Ultima Online. Examensarbete i medieteknik om 20 poäng vid Programmet för medieteknik, Kungliga Tekniska Högskolan år 2005. Posted on January 19, 2013. This entry was posted in MMORPG. Bookmark the permalink.